Maximize the storage capacity of your laptop with the Toshiba MK5061GSY hard drive. To facilitate faster data transfer, this Toshiba 500 GB hard drive is incorporated with a Serial ATA interface. Featuring a memory capacity of 500 GB, this internal hard drive lets you store tons of media and vital business documents. Additionally, the Toshiba 500 GB hard drive adopts the perpendicular magnetic recording (PMR) technology that makes the disk to store more data by recording in vertical axis with silent acoustics and thermal stability. During idle conditions, the ramp load technology avoids the head from contacting with the disk for prolonging the service life of the Toshiba MK5061GSY hard drive. 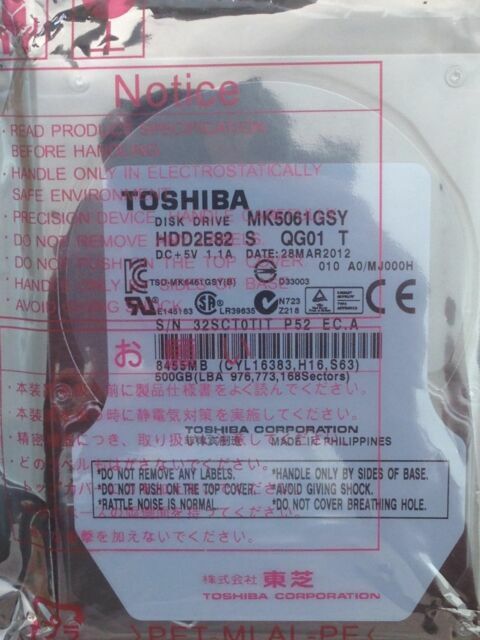 And the spindle speed of 7200 RPM in this Toshiba 500 GB hard drive executes read and write operations swiftly. What’s more, you can also use this internal hard drive in mobile PCs, game consoles, printers, and external storage devices, thanks to its 2.5-inch form factor. great tool if you need to extend your current disk space in your NB. I can only recommend. easy installation, easy configuration. nothing necessary to install because it replace only the currently used sata port ( by DVD device ) with SATA HDD. awesome sata device! Easy to install, but had to get someone else to get windows 10 activated and ran, because after installing, it states that it needs to be rebooted, does not come with windows installed, so beside that, it installed easily, and after windows was installed, it was smooth sailing... very quick. It is a very useful product!!! Great purchase, it was exactly what I needed it, I was running out of space on my hard drive, just bought this one clone mine to the new one and it started working with it right away and performed fine!! !